The Summerlanders are generally agrarian, led by a royal family of weathermages, the Coruscates, who are descended from the family line of Summerlea’s greatest king, Roland Soldeus. Summerlanders are dark-complected and generally black-haired, although due to intermarriage with other peoples of Mystral, some genetic variations do appear (such as Princess Autumn Coruscate’s auburn hair). The immediate royal family of Summerlea (those born with the red Rose birthmark on their wrists) are weathermages whose gifts are tied to the sun. The strength and abilities of those weather gifts vary from person to person, but in general, Summerlea’s royal weathermages can moderate temperatures, call winds, summon rain. Typically each royal is stronger in a particular aspect of weather magic. Most royals are given a gift name in addition to their birth name. The gift name indicates a particular magical strength or unique magical talent. Outside the royal family, most Summerlanders also possess a gift for growing things. This gift, in addition to the royal family’s ability to manipulate weather, has helped make Summerlea a thriving agricultural center. Summerlea is a hereditary monarchy, ruled by a king and/or queen. The crown is passed to the eldest son of the current monarch, or to the eldest daughter if the monarch has no living sons. Only individuals bearing the red Rose of Summerlea are eligible heirs to the Summer Throne. The Summerlea Rose birthmark does not pass out of the direct royal line. All children of a crowned King or Queen of Summerlea are born with the Rose, but only the current crowned King or Queen of Summerlea will pass on the Rose to his/her children. Outside of the monarchy, the land is governed through a patriarchal feudal system. At the top of the feudal hierarchy are the nobles, who are awarded hereditary title to their lands in return for fealty and knights’ service to the crown. There is a small middle class of merchants and businessmen, but most of the population work in the fields, orchards, and vineyards of Summerlea, coaxing from the soil the kingdom’s abundant wealth of edible foodstuffs. With its plentiful supply of food and its thriving economic trade, starvation and poverty are all but unheard of in Summerlea. However, education and upward mobility of the lower classes are generally not encouraged. A stratified class system “almost as rigid as a caste system” remains firmly entrenched in Summerlea society. Summerlanders worship a pantheon of gods, with Helos the Sun God primary among them. They believe in Halla (heaven) and Hel. Summerlanders speak Eru, the common tongue of Mystral. The primary magic of Wintercraig is clan-based magic, tied to animal spirits, which gifts members of that clan with talents or attributes of their particular clan animal, as well as the ability to communicate telepathically with their clan animal. Some Winterfolk are strong enough in their clan magic to control and direct the actions of their clan animal as well. Winterfolk are born with a clan-mark upon their wrists' a birthmark symbol of their clan affiliation and clan magic. In addition to clan Magic, the royal family of Wintercraig also possess a weathergift, much like the weathergifts of Summerlea, but tied to winter rather than summer. The greatest and deadliest of all Wintercraig magic is the legendary Ice Heart, the essence of a murdered god. One sip from the Ice Heart gives devastating cold-based magic, including the deadly Ice Gaze, the ability to freeze anything into solid ice simply by looking at it. But use of the Ice Heart comes with a dangerous and potentially world-ending price. Rugged outdoorsmen and individualistic, Winterfolk live in closely-knit, clan-based societies. Winterfolk tend to be unwelcoming of strangers. Sheep farming, lumber, hunting, trapping, fishing, and limited farming in southern Wintercraig (the Hills) are the kingdom's primary industries. Winterfolk worship the northern gods, Wyrn (Goddess of Winter) chief among them. Unlike Summerlanders, Winterfolk believe the gods have and continue to interact directly in the lives of Wintercraig's people. Winterfolk speak Eru, Mystral's common tongue, and also Ice Tongue, a northern dialect unique to Wintercraig. The Calbernans are an island-based, seafaring race with power over the sea and all the creatures in it. Calberna is a matriarchal society ruled by a hereditary female monarch. The society is divided into familial Houses, headed by the eldest female of the most powerful familial line. Female children are born only very rarely to Calbernan families and are, thus, considered the greatest treasures of the nation. Unwed Calbernan males are mercenaries, sailors, and seafaring merchants. They are famous for their protectiveness towards women. Calbernan males spend their youths learning and perfecting the skills of sailing, warfare, and trade, until they earn 'gold and glory' enough to claim a wife of their own. The small kingdom of Sea Haven on Ã†sir Isle is home to the Havenfolk. Very similar in genetic makeup to the Summerlanders, Havenfolk are peace loving fishermen. They are ruled by a hereditary monarchy, whose crown passes to the eldest son or daughter of the current monarch. Seahaven magic is subtle. In addition to a gift for growing things, Havenfolk possess a magical power of persuasion. They cannot take over a person's mind, but they can subtly influence others towards peace and non-aggression. This is one reason why, despite its small size, Sea Haven has remained an independent nation, and why its seafaring trade thrives even against the might of Calberna. The daughters and sons of Sea Haven have frequently intermarried with Summerlanders. Khamsin's mother, Queen Rosalind of Summerlea was born a princess of Sea Haven. 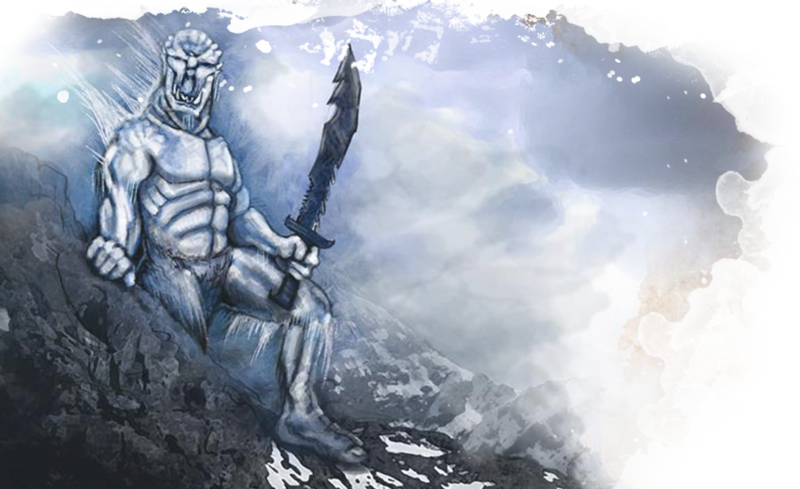 Servants of Rorjak, the deadly Ice King of Wintercraig legend, the Frost Giants are monsters that live in the icy reaches of the Skoerr Mountains. Blue-skinned, twenty feet tall, and ferocious, these colossal monsters rarely venture from their icy territory, but when they do, they wreak havoc. 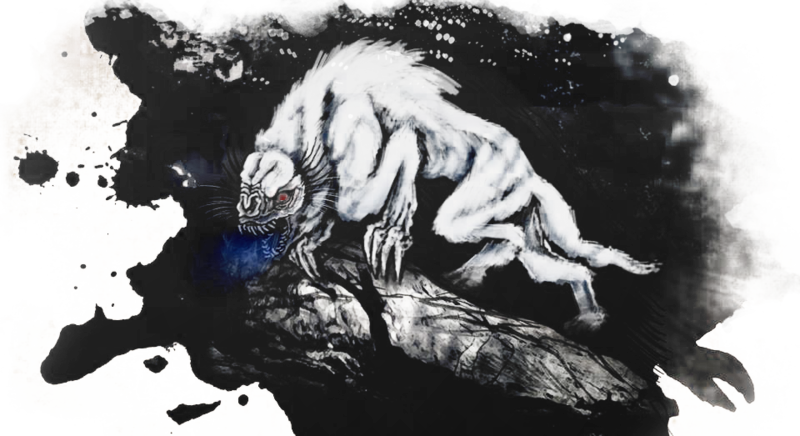 Garm, the monstrous, scarlet-eyed 'Ice Wolves' of Wintercraig legend, live in the glaciers of the Skoerr Mountains and are counted among the deadliest creatures on Mystral. Garm have the body and fur of giant wolves, but there the resemblance ends. Earless, with slitted nostrils, rows of razor-sharp teeth, and motion-detecting sensory hairs sprouting from their heads, these ferocious predators use a combination of their paralyzing screams and icy, blue vaporous breath to stun and freeze their prey. Most folk who get close enough to a garm to hear its scream never live to tell the tale. Copyright © 2019 C.L. Wilson. All Rights Reserved.